So, I am still Christmasing! Yes, it's January 2nd, my lights are still on, and if the stores still had eggnog I'd be sipping a little glass of that heavenly concoction too! 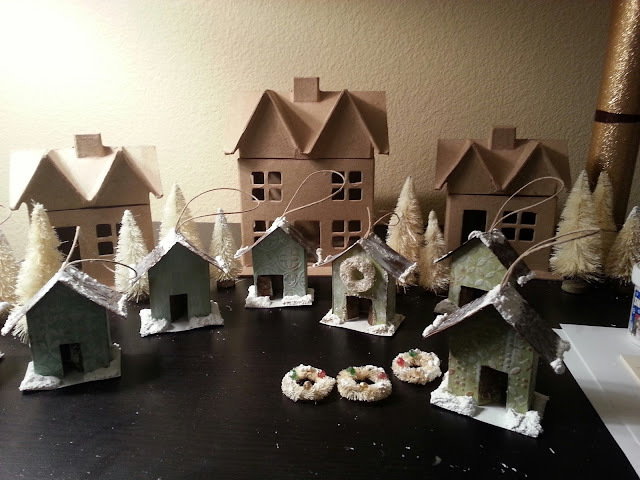 Christmas technically lasts through January 6th, King's Day or Epiphany...so I am still happily creating some cool Christmas crafts that will add some vintage charm to your holiday decor, next year. I am fascinated with miniatures anyway. And I am especially drawn to glitter houses at Christmas. 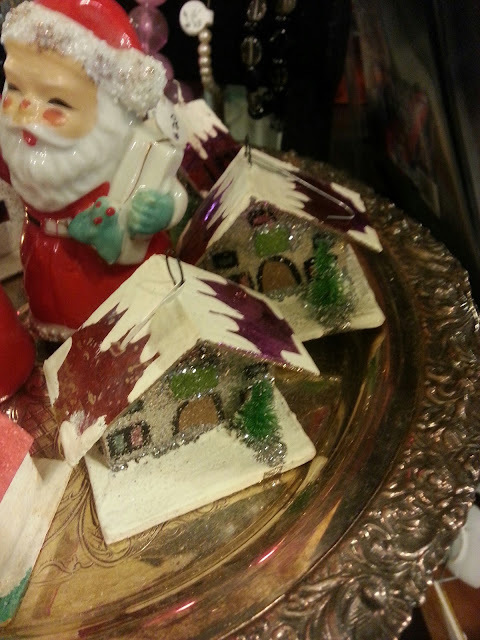 Traditionally, Glitter Houses or Putz Houses are German in origin. And at the turn of the 20th century gained popularity in the United States due to the growing population of immigrants and the rise of readily available manufactured goods from the US and Japan. So, you might have noticed I also called them Putz Houses...they came to be known as "putz" houses because German families often set up their display around a train set or the Christmas tree or near their creche, and often added to the collection throughout the holiday...they "putzed" around with the decorations throughout the season. Over the past few years, glitter houses have seen a surge in popularity as artists like Bethany Lowe, Melissa Frances, Kathi Lorance Bejma, even Martha Stewart have shown various styles of glitter houses in their seasonal lines. Glitter houses were at the height of their popularity in the US in the 1930's and 1940's and were for the most part imported from Japan. 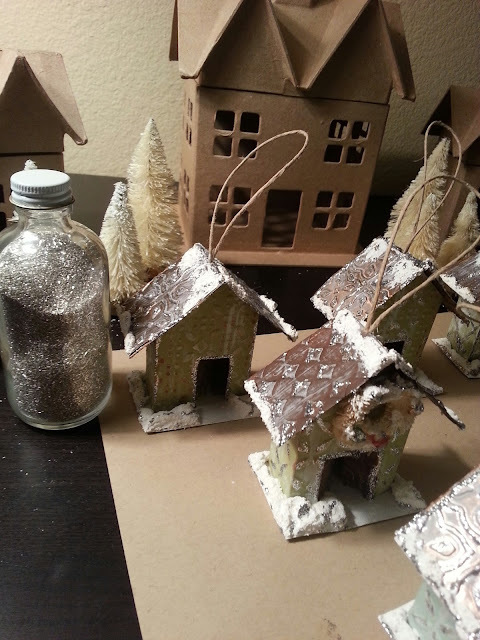 I ran across these two examples recently at an antiques mall and was inspired...I wanted to recreate some glitter house ornaments, that were a little more "primitive" in style, but that would still have a little bit of the glitz that makes glitter houses so fun. 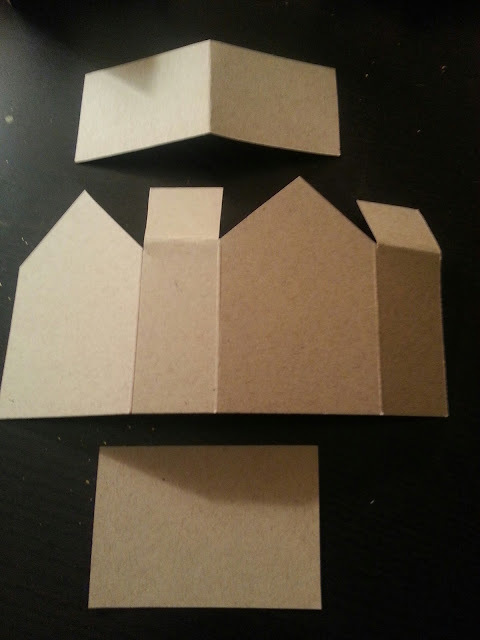 First, I created a simple prototype pattern out of kraft paper. It's easy to do, just by easy eyeballing and estimating. In the photo above you'll see the base, the house and the roof. A scoreboard makes this easy too. 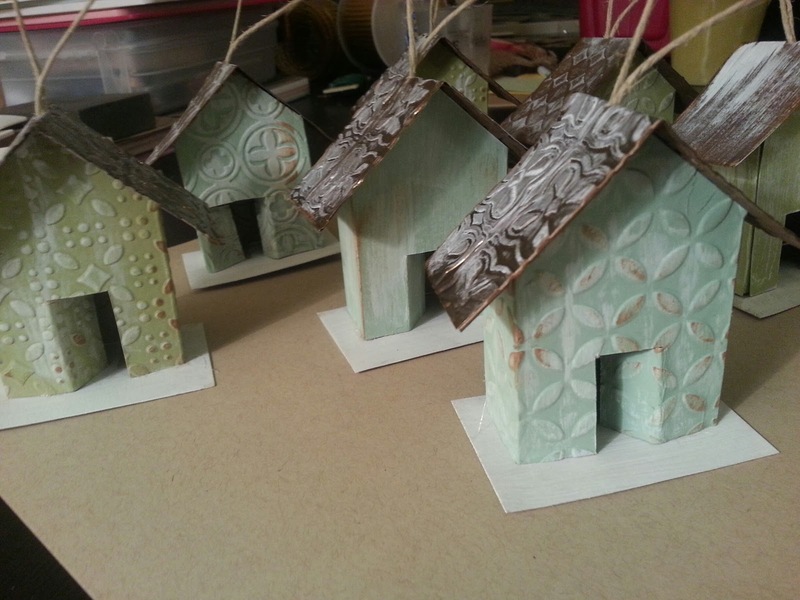 I like the sturdy weight of kraft, especially since I knew I was going to paint, embellish and glitter the houses. 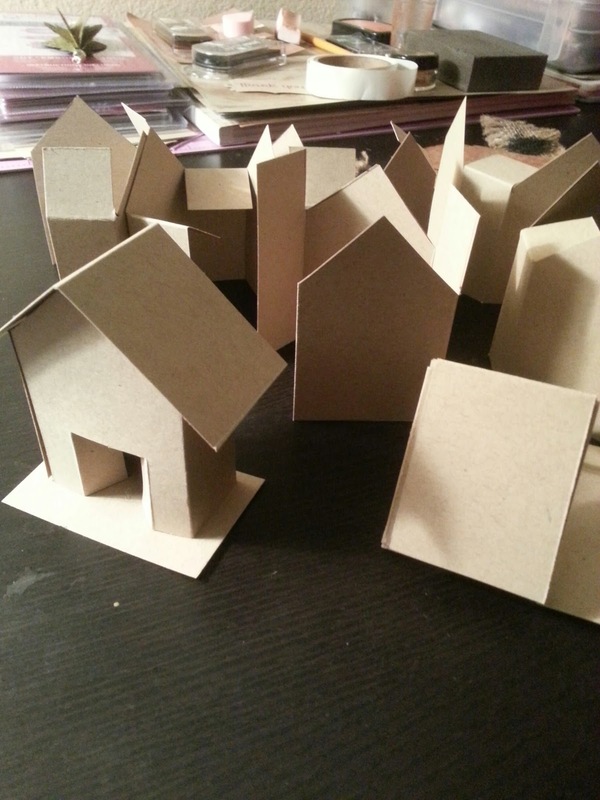 Then I created a bunch of little houses. Really, it's easy...and before I painted them, I cut doors, some single and some double. I wanted them each to be a little different. Then, I gave them all a coat of Deco Arts Americana Acrylic Paint choosing soft pastels. And dry brushed the roof sections with brown. 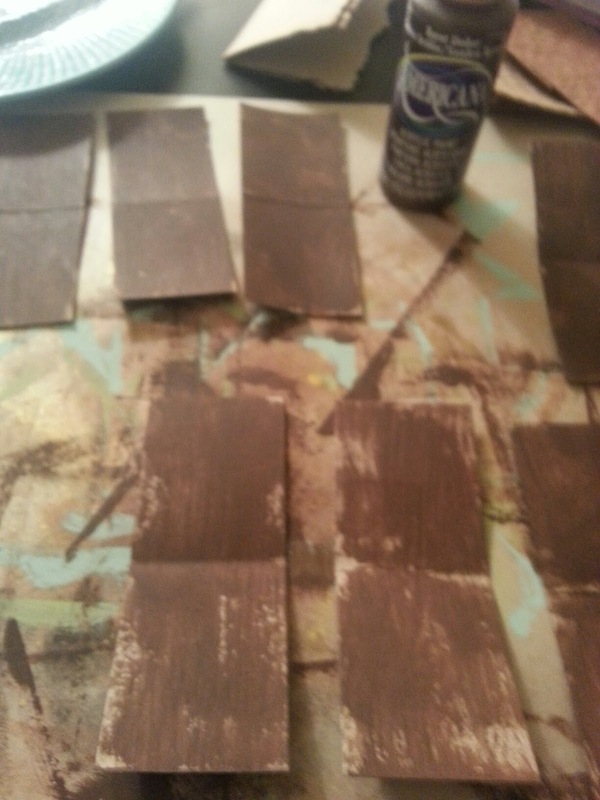 You will notice later on that I used craft foil for some of the roofs. I really wanted to add some "architectural" detail too, so I embossed the houses and roofs with various Spellbinders MBossabiltiy Folders. Just a quick tip...I embossed after I painted. I wanted the embossed details to be crisp...the acrylic paint on the paper really embosses well. If you'd like to see a little more about embossing with Spellbinders MBossability Folders, we featured it on Spellbinders "Try it Tuesday." 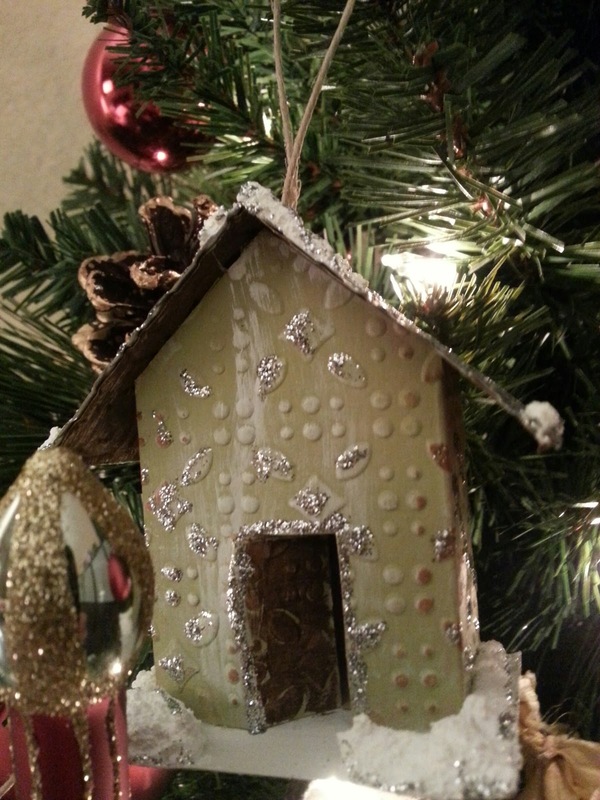 I really love the detail embossing adds to paper crafting and it's perfect for ornaments like these. Then I assembled the houses, dry brushed them with white paint, and lightly inked with brown ink. Next, I got to make a few little "bottle brush" wreaths for decorations...you could add trees too. And slowly the houses started coming together. 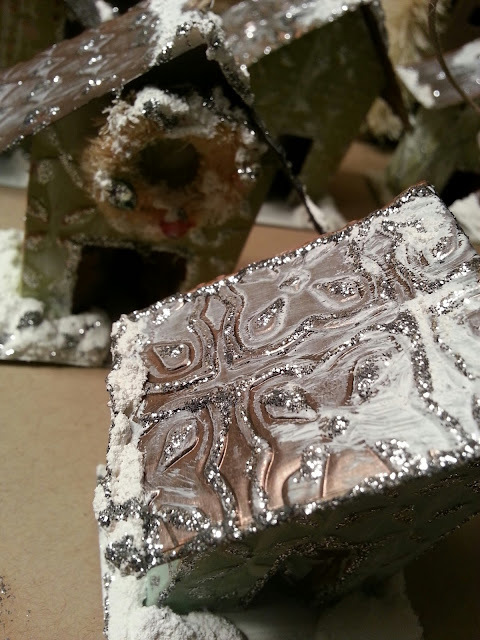 If you set out to create some glitter houses, get something called Snow Tex from DecoArt. It's cool stuff that lets you add snow where ever you want it. I piled it on each house. Then, on to glittering...I splurged a little and used antique glass glitter for this. It's chunky and really reflective. 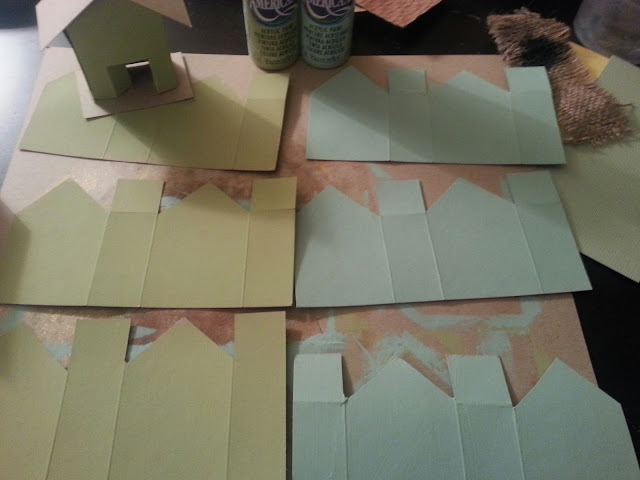 I dry brushed liquid adhesive on the houses and then glittered. The glue just hit the high points of the embossed surfaces...so the glitter stick to the high points creating patterns in glitter. I love how these turned out...yes they are a little "primitive" in style, I like that. it harkens to a simpler time in the past when handmade traditions were an important part of family holiday celebrations. 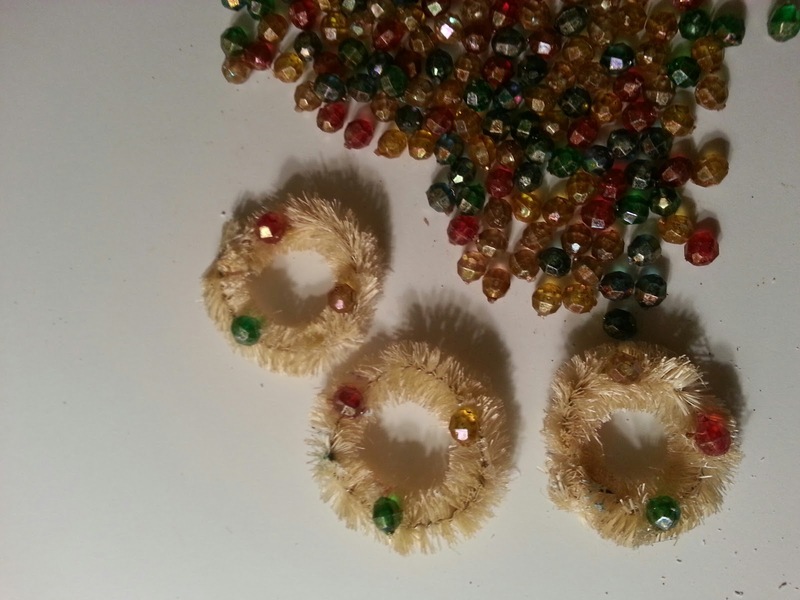 Yes, I know it's already January, but I am still Christmasing...I like to work on Christmas projects all year...it keeps the spirit of Christmas alive inside me year 'round. Thanks for spending some time with me today to learn more about glitter houses! omg, I love these Ken!! I am watching this great video!! I love the card and tags that you both have made!! I would really love to get the whole system! Thank you so much for this video!! It really has opened up a whole new creative world for me to explore!! What a gorgeous collection of Putz houses you have made. Funny how memory gets stirred. I now remember walking down a street in a small German town, glancing in a window, not at Christmas and seeing a little group of these type of houses on a shelf. Of course I had to go in and sadly no I could not bring one home as there were many many km's to keep dragging that ever filling suitcase. I hope you are enjoying your decorations - it's my excuse for keeping our home Christmassy. I really love your little houses. 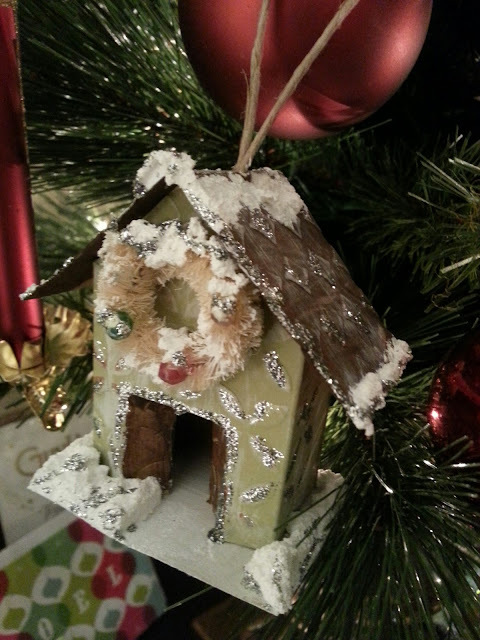 I had great fun with my Grandson making lots of these for Christmas.. mine had my own interpretation, like yours, as I was limited to the materials to hand. 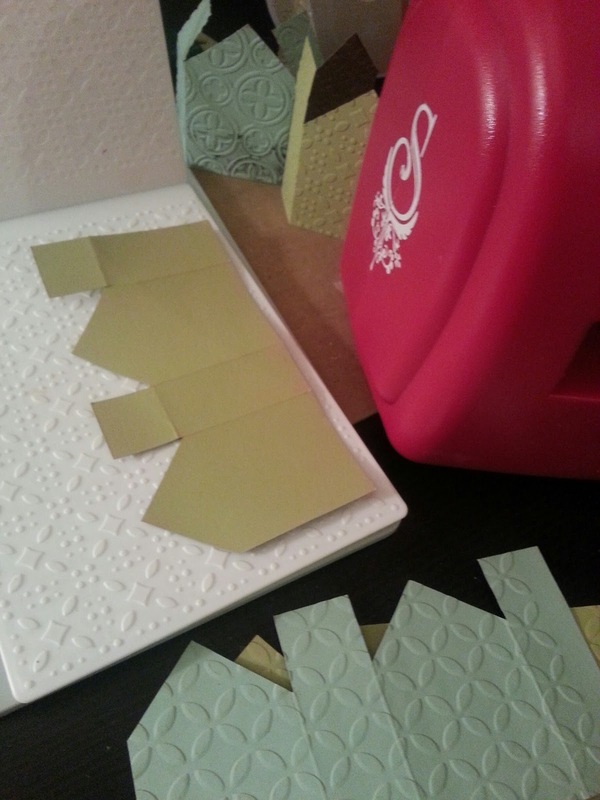 They are on my blog.I love your idea of embossing to create texture..I will remember that! Such great fun.. I will be doing more next year! Thank you for your inspiration. RCI holidays - Its Awesome, so sweet you are ! Nice little houses. Not all vintage design looks good but this one looks special. I'd try these modifications for sure in my house.